premium versions of their card-reading app. This app is perfect for the iPhone-loving Dad. Is the home office cluttered with hundreds of business cards? Rolodex collecting dust? Scan. Click. Upload. 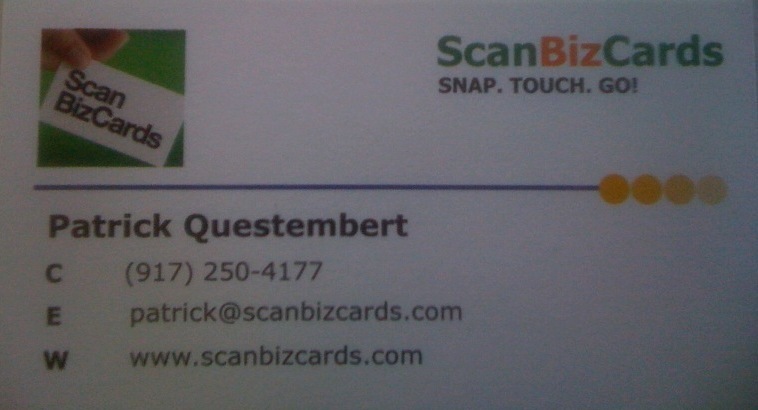 The ScanBizCards iPhone app automatically transfers a business card collection into your smart phone contact list, can send an introductory email, and even connect on LinkedIn. A digital album on the app keeps the cards in the original form for sharing later on and for reference. Take a new photo or select from saved photos. Don’t worry about the orientation. The app automatically detects it and rotates the image accordingly. Crop the image for a quicker and more accurate scan or just to save a nicer thumbnail. Touch “Add To Address Book”. The card image is attached to the new contact entry. You don’t have to add to the address book if you don’t want to. After a scan, send a Quick Intro email to the new contact with your own info. Forward the contact (scanned text + image + V-card) to a co-worker or friend. Invite the new contact to join your LinkedIn network without ever leaving the app! Add a calendar reminder to follow-up right from within the app (synchronized with the iPhone calendar or your Desktop calendar). Phone numbers, email addresses and URLs recognized during the scan appear highlighted, allowing you to use them immediately just by touching the. Organize your cards in custom folders to group contacts from a particular tradeshow, industry or anything else. Status icons let you see at a glance whether each card was added to the address book, whether a calendar reminder was set, if you made notes in that card or if a LinkedIn invite was sent. Flip through your cards in attractive 3D “cover flow” interface. Export selected cards to Excel file – then import into Salesforce, Highrise, ACT or other CRM. Win a premium version of the ScanBizCards iPhone app. To enter the contest, simply fill out a survey at http://survey.io/survey/bd7b8. Please ensure that you type in your email address at end of the survey page so that we can contact you if you win. Last date for entries is June 20, 2010.